"Hi Norman. Just a quick note to say thank you. I've just received my "8 galloping horses" pen and thrilled it arrived so quickly. No arguments from me... I agree, it's difficult to spot the 8 horses. The best I can find is 7, so I'll have to invest in a magnifying glass or go and see an optometrist. Again thank you for the awesome service." 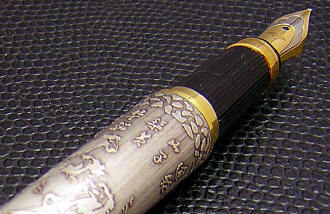 "I recently bought a Baoer 8 Horses fountain pen from hisnibs.com. I am extremely pleased with this pen. 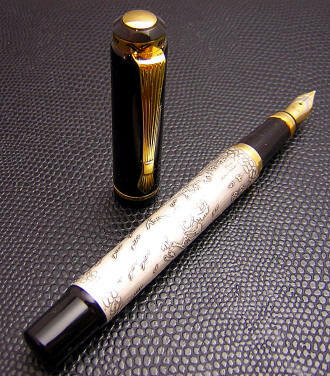 I previously owned one of these pens (bought elsewhere) when I was a fountain pen newbie. It didn’t write smoothly, and not really knowing what I was doing, I proceeded to ruin it, trying to get it to write nicely. So when I saw this pen on hisnibs.com, with the promise that every pen sold would be adjusted if necessary, I took the plunge and bought it. I really liked the design and wanted one. Evidently it was adjusted, because it writes beautifully, like what I consider to be a perfect fine point. I am very happy with my purchase and have already ordered another pen from this seller. I will continue to shop here because I have bought many, many fountain pens in the past (from other sellers) that did not write well from the start, and it is a huge benefit to have my pens inspected and adjusted before they are sent out. Hopefully I will never have to suffer with a scratchy nib again!" 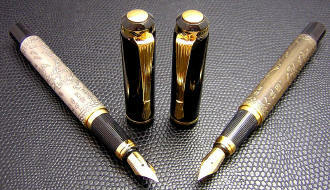 "I received the inks and the surprise pen last Monday, which would have been October 1st. I absolutely love the Baoer 8 Horses pen. It writes like a dream and moves across the page so quickly I have to make sure I don't end up scribbling words that don't exist! It's filled with the Private Reserve Velvet Black and I love the ink. I knew I needed black, but I didn't know I would enjoy it so much. Who knew such a 'boring' color could be so much fun to use...I still can't believe how a pen could float across a page. I almost feel guilty that I want to use it more than the other two I have. It might be new pen addiction, but honestly, the pen is simply amazing." "Thanks Norman for the prompt shipping and careful packaging! I already had one of these “8 horses” pens and it is indeed a challenge to count all 8! It’s a great pen and one that I could afford to give as gifts to friends who feel they cannot afford a good fountain pen. This one writes better than my vintage mabie-todd." "Hi Norman: Just wanted to let you know I received the pen and it is really beautiful. I gave it as a gift to a girl leaving where I work. She is a pen collector and also horse lover so I thought it would be a perfect present. She loved the pen and in fact she found all 8 horses. She says there is a horse behind another horse (I guess twice). I don't have the pen here to look at it but I saw here examining the pen with a magnifying glass so I guess she is right." "Hi Norman, I’m gonna rave about the Baoer 8 Horses that came today. It is the smoothest nib I have ever used! That includes many $100-200 pens in my collection. 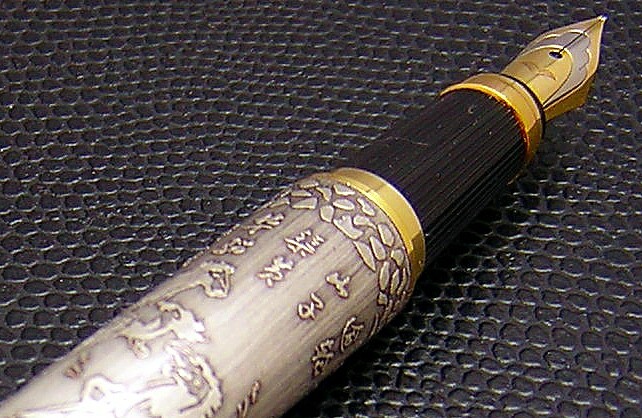 Nobody is going to believe that this is a $20 pen. The brass construction gives it a solid feel, and it balances perfectly in my hand even when posted. 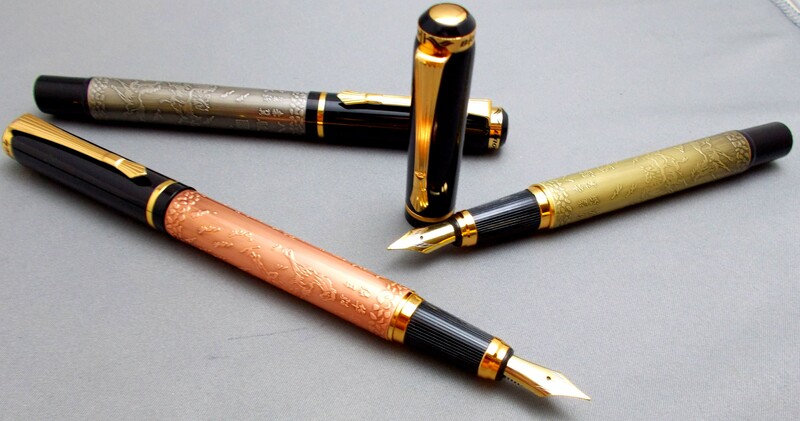 I have the bronze finish, and am running Pelikan Brilliant Brown – makes for a nice combination!" "Hello Norman. The pen arrived today. It writes beautifully and looks even better in reality than on the website." "The Baoer 8 Horse was a father's day gift for me and I found the Levenger Cocoa ink to be a good match, and enhances the ancient motif. 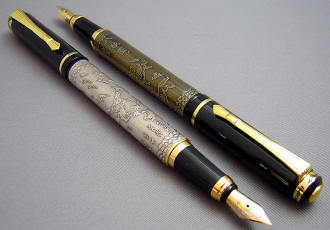 The Baoer is a good size and weight, and has a smooth medium nib with just a bit of flex, very nice." "Got my pen today. LUV it! I like the way it feels in my hand, also, it's one of the smoothest writing pens I have. Thanks." 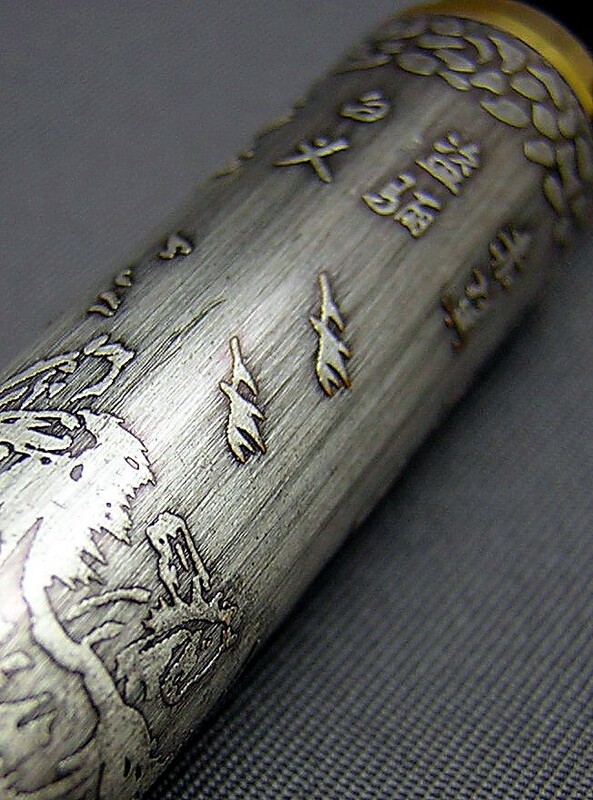 "The Baoer 8- Horse Silver & Bronze Fountain Pen is time past with its Asian calligraphy and its engraved horses. 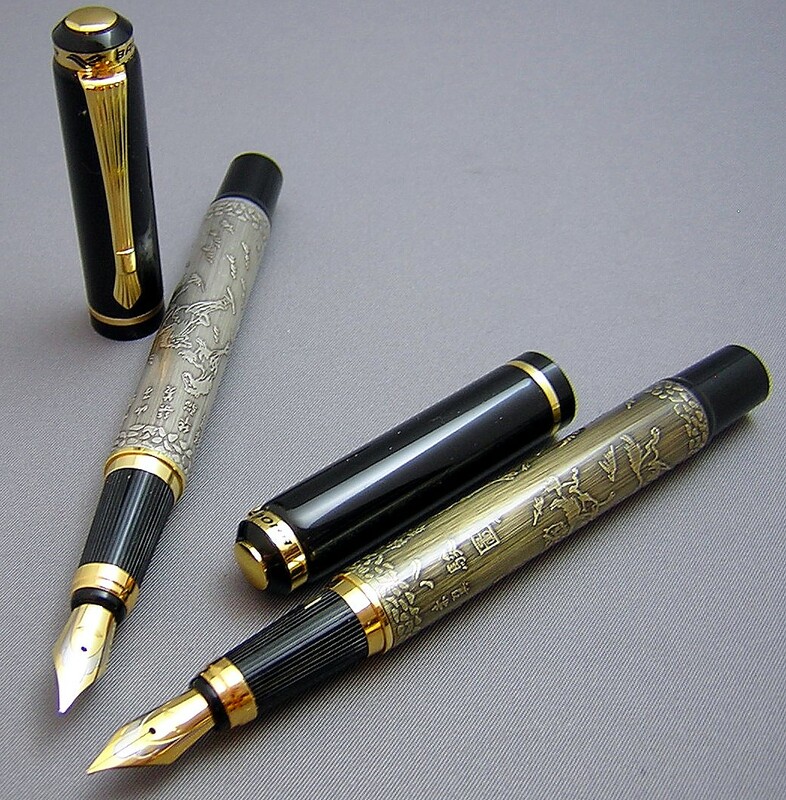 The black cap with its striking gold accent crowns this beautiful pen. It’s medium weight fits snugly in your shirt pocket and will be well noticed by everyone you meet. 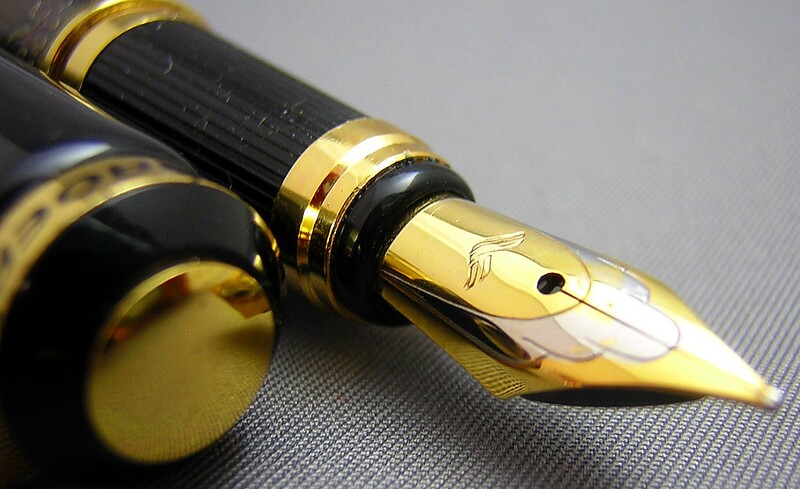 I love how the cap fits tightly on the end of the pen, well balanced. It’s like writing with a royal scepter. A pen of antiquity is a welcome addition to anyone's collection. I’m glad I acquired both the silver and bronze." "Norman, the pens arrived today. Thank you so much! Just wanted to say, I really can't believe the Baoer is "just" a $20 pen. Nicely made, nicely fit, writes excellently. I think this is a real sleeper, and a real steal. The Haolilai is every bit as nice (I refilled it with PR Burgundy Mist, as I was looking for a darker ink), but there's just something about the 8-Horse that really appeals to me. 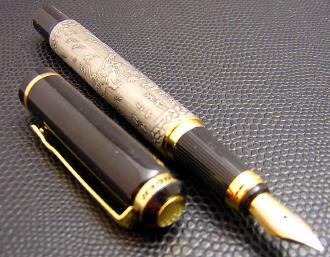 Maybe it's the historian in me, and the "vintage bronze" look of the pen. But... Well, I like 'em both! Thanks again, Norman. 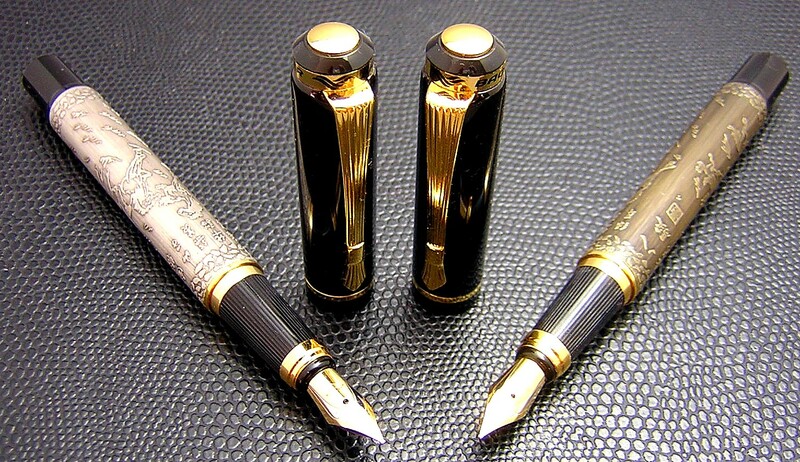 Very wonderful pens. And excellent service, as always!" All right, let me clear this up from the beginning. There are only six horses depicted on the barrel of each pen (as far as my eyes can tell) -- you'll just have to get both versions to get the full quota -- with a few to spare. [many sharp-eyed customers have since identified all eight!]. However, the depiction -- and the Chinese characters -- refers to the tradition of giving a scroll or painting of eight horses to a friend as a blessing for a prominent life or career. 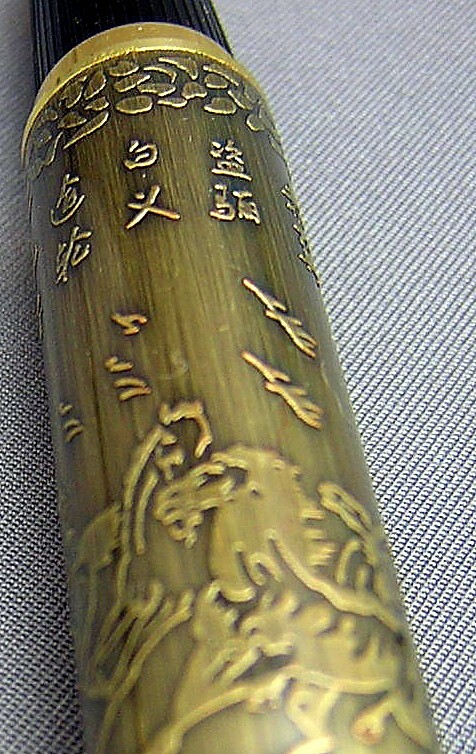 The number eight is considered to be the most fortuitous or lucky number among the Chinese, and it symbolizes wealth and success. As one source says: "Running horses are full of energy and encouraging spirit, inspiring people to work hard and pursue their own goals." You can read more about the significance of the Chinese relationship to 'Celestial Horses' here. 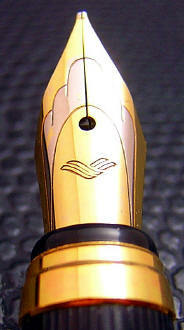 The pen is a full-sized one, measuring 5-3/8" capped, 6-1/2" posted and 4-7/8" with cap held aside. All three versions have an aged appearance to their metal barrels which is quite fetching. It makes one think that they were recovered from a secret cache of a long-ago dynasty. My wife and I have both examined the clip and believe that it represents a horse's tail -- or perhaps its mane -- tie together near its end. The cap's top has Baoer imprinted upon it twice, along with the company's logo (which is suspended in the Black Rectangles model). 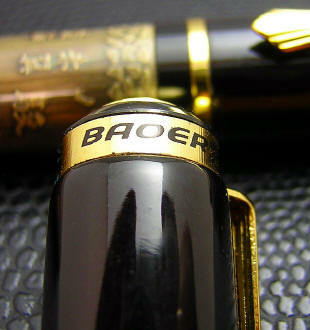 The cap itself snaps firmly in place upon re-capping, and removing it reveals the two-toned steel nib, which again reprises the Baoer logo. The nib falls into my light-medium category, which mean that I judge it to fall in between a typical western fine and medium....although these nibs tend to run a bit closer to a true medium. The pens come with a piston converter for bottled ink, which includes a little agitator ball inside to help break the surface tension of the ink on the converter walls. As with all new pens, I recommend to run a dilute solution of dishwashing soap (two or three drops to a small bowl of water) through a new pen a few times, followed by water only. Step one is effective at removing manufacturing oils that can tend to make the ink less than enthusiastic in heading from the converter/filler to the nib, and step two removes the traces of the detergent you've used...which tends to have the opposite, diuretic effect.